With a lantern suspended inches above its razor-sharp gnashers, the Deep Sea Angler Fish is a lamp that’ll make you think twice before turning the light on. The five-foot-tall lighting fixture, designed by artist Justin La Doux, is inspired by bioluminescent creatures that inhabit the shadowy realm of deep waters. Its teeth are made of knives, forks and scissors, while various bicycle parts, shovels and other discarded objects make up the rest of its body. 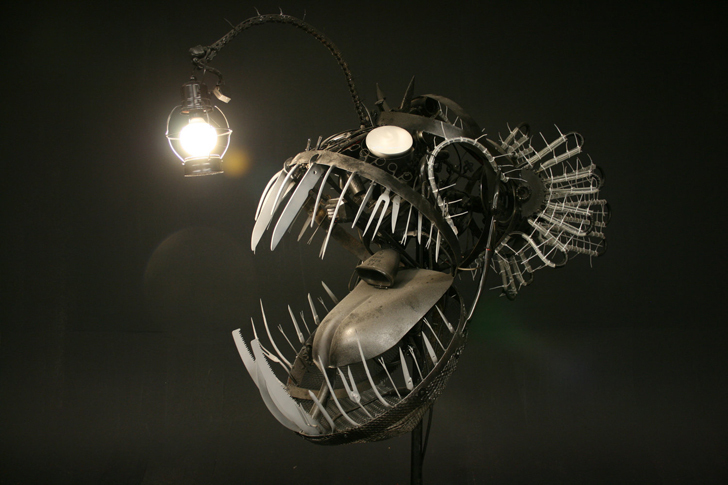 Just like the real Angler Fish, creating a natural lure to draw its next meal, the lamp lights up slowly with a motion sensor mechanism. Protruding above the huge toothy mouth is an element called ‘the fishing pole,’ which baits prey close enough to be snatched. At first, the light over the head glows brightly, followed by the rest of the structure, as the ‘victim’ gets closer. Design aside, looking at the lamp, the first images that pop into all Pixar fans’ minds are those of the scary chase scenes from Finding Nemo. 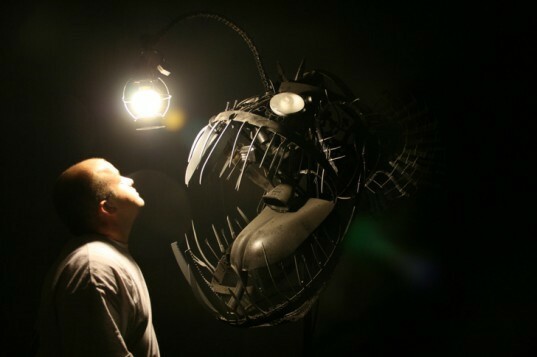 The Deep Sea Angler Fish Lamp uses energy efficient lighting sources and turns recycling into an art form. This piece is part of lager sculpture entitled Deep Sea “Creatures of the Deep” that was entered into the 2010 ArtPrize contest and got in the top 100 out of 1,700 other artists. With a lantern suspended inches above its razor-sharp gnashers, the Deep Sea Angler Fish is a lamp that'll make you think twice before turning the light on. The five-foot-tall lighting fixture, designed by artist Justin La Doux, is inspired by bioluminescent creatures that inhabit the shadowy realm of deep waters. Its teeth are made of knives, forks and scissors, while various bicycle parts, shovels and other discarded objects make up the rest of its body.